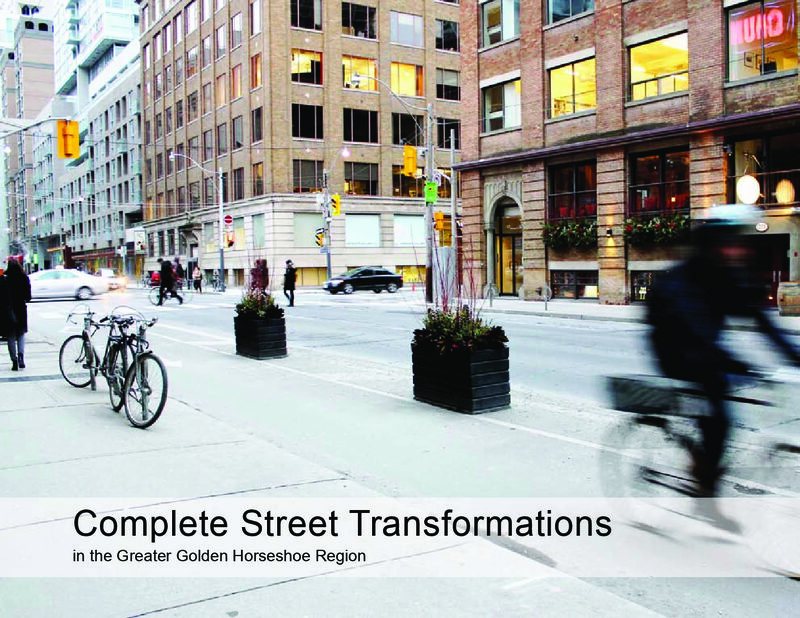 Complete Street Transformations in the Greater Golden Horseshoe Region is a book featuring nine projects from municipalities throughout the region which involved redesigning streets to make more space for pedestrians, cyclists, or transit riders. In each case, a variety of photographs, illustrations and infographics tell the story of how each street was redesigned. This makes the information in the book both useful to professionals, as well as easy to understand at a glance for the general public. The various real-world examples featured in the book demonstrate the many forms that Complete Streets can take. Street redesigns range from the simple addition of painted bike lanes to multi-million dollar transit projects. Other streets profiled in the book have seen expanded sidewalks, streetscaping, or new safety or accessibility features to encourage pedestrian activity. The book is a joint project between The Centre for Active Transportation (TCAT), Ryerson University, and the University of Toronto, with funding from the Government of Ontario through the Places to Grow Implementation Fund. This research builds on the previous reports on Theme of Understanding Complete Streets in the Greater Golden Horseshoe Region, including The Complete Streets Catalogue, as well as Complete Streets Evaluation.